For those of you who are used to publishing your blogs through Google's Blogger platform, you may be familiar with that nifty little gadget known as the Followers gadget. This gadget displays the list of users that love to follow your blog posts. What's more, it allows blog readers to choose to become followers and add themselves to your followers' list. Well, following Google's spring cleaning in 2011, and to push more of its Google+ packages, many of the Google Friend Connect services have been retired. 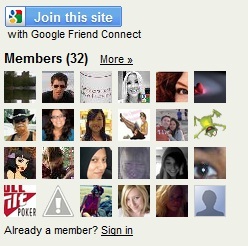 This includes the Followers gadget in Blogger, which Google recommends to be replaced with Google+ Followers gadget. Access your Blogger Dashboard. Go to Layout, and in the place where you want the gadget to appear, click on Add a Gadget. In the next window that pops up, copy the link that appears in the address box. Close the window after you have copied the link. Edit the link in a text editor like Notepad. Replace the text 'widgetType=HTML' with 'widgetType=Followers', careful not to change anything else in the text. Open a new window in your browser and paste the modified link into the address box. Click Enter to add the Followers gadget successfully to your blog.